Two weeks after Marine commanders announced that 3rd Battalion, 8th Marines, and other elements of the 26th Marine Expeditionary Unit would deploy from Navy ships in the Indian Ocean to Afghanistan, the unit is conducting operations outside the wire, officials said. In a new news release, Marine officials say Battalion Landing Team 3/8, out of Camp Lejeune, N.C., to exploit progress made by Marines assigned to Regimental Combat Team 2. The regiment is based in northern Helmand province, and includes 3rd Battalion, 5th Marines, out of Camp Pendleton, Calif., Lejeune’s 1st Battalion, 8th Marines, and several other units. The BLT moved out from Camp Leatherneck during the past several days by ground convoy and via aircraft from another 26th MEU element supporting Operation Enduring Freedom, Marine Medium Tiltrotor Squadron 266 (Reinforced). The BLT Marines and sailors will establish and maintain security in portions of Helmand province not previously permanently occupied by ISAF. The security the Marines provide is intended to neutralize insurgent networks and support development projects, allowing the Government of the Islamic Republic of Afghanistan to foster socioeconomic development in the area. 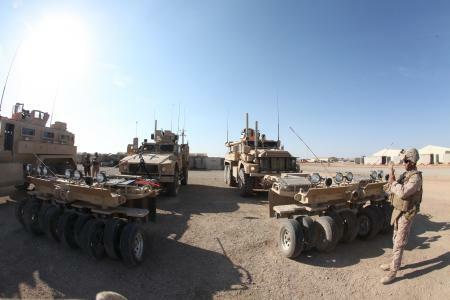 The latest news release doesn’t say it, but Maj. Gen. Richard Mills, commander of Marine forces in Afghanistan, has said previously that 3/8 will deploy to the Upper Gereshk Valley, an area in between violent Sangin district and Lashkar Gah, Helmand’s capital. My prayers are with the commands out there as well as the families of those deployed. I pray that 3/8 comes home in the time slot that they are supposed to as well. Its hard enough for them to already be slated for a 9 month deployment, i just hope that its not turned into a year with this new mission.